Creative Think: Here's to the Graduates! Here's to all the graduates of the class of '07! 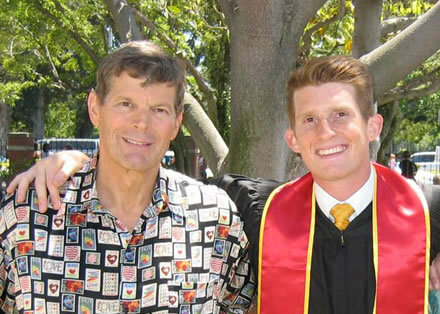 This past weekend, our family assembled in Los Angeles to attend the graduation of my son, Alex von Oech, from the University of Southern California (USC). Here's a photo of the proud father and recent graduate. Graduations are fun! Lots of pomp, celebration, speech-making, and pageantry. Graduations are a wonderful family time! I saw family after family each prouder than the next of the newly-minted graduate in its midst. And ours was no exception! Graduations are inspiring! There are times when it's easy to get overwhelmed by the problems and issues before us. But all you need to do to get over those feelings is to take a look at the incredibly talented and energetic graduates who are entering into society! Good luck to all the grads — and their families! Congratulations to your son, Roger. Pagentry is a grand thing to experience and witness. For a short time, we are whisked away to another place. A place where everything is good and beautiful. A place where families are drawn together with friends. A place where dreams can be realized. Congrats to you and Alex! Unfortunately there is also a dark side to Graduations... A lot of those bright young people approach it as The End of school rather than The Beginning of their personal adventure. They celebrate "finishing" more than they celebrate "beginning". I hope your son knows that now that the school is over he has to learn twice as hard he did before. I still fondly remember my graduation. It was a great turning point and personal celebration. Good luck Alex! Congratulations Roger to you and your son. I agree. I remember all my graduations as inspiring and as a time to look forward. Just back from holiday and discover your post now. Congratulations to Alex! Wish him the best for all his future projects!